Phone Vegas Casino will then reward you with a bonus (Welcome Bonus is for new players only). The terms and conditions of the bonuses vary between different casinos and might also change over time and between different countries, so it is important to compare the different offers and read the T&C for Phone Vegas Casino before signing up. The time has come when you can carry Vegas casinos in your phone – you don’t even need to keep them separated, just load Phone Vegas Casino and you can have it all in one place. 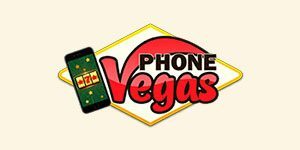 Phone Vegas was established in September 2016 by ProgressPlay Limited, an organisation that is registered in Malta, and one that has a rather positive reputation in the industry. With a strong character, Phone Vegas Casino aims to attract avid gamblers and mobile users to entertain themselves with top-quality gambling games from proven providers. Phone Vegas website is available only in English, and doesn’t require any additional software or app to be playable on mobile – the site is mobile responsive and can be accessed through the regular mobile browser. All the games offer demo play along with real money play, and a bit of info for each title. At Phone Vegas, players can take pleasure in slot games, blackjack, roulette, poker and even live dealer games. New players have the chance to double their first deposit by accepting a 100% welcome bonus up to $/£/€200, and if they stick around there is a plethora of interesting promotions to choose from, not to mention five VIP statuses to maintain. The Las Vegas skyline serves as background for Phone Vegas, and as a reminder that anything is possible once you load your favourite slot machine or take a seat at the blackjack table. The lively ambiance is further enhanced with colourful thumbnails of featured games, and all the player needs to do is click. Phone Vegas is a well-organised casino venue where you don’t need to wander around trying to find something. You can navigate to categories of Slots. Mobile, Table Games, Promotions and Scratch Cards. The site could benefit from a search bar, though. What becomes evident since the first visit, Phone Vegas is supplied with the best games on the market. Provided by the likes of NetEnt, Microgaming, Extreme Live Gaming, Quickspin, Lightning Box, Big Time Gaming, Thunderkick, Cryptologic and Rabcat, slots and table games hosted at Phone Vegas will work smoothly on your mobile and computer device. The collection is as diverse as possible with titles added by Blueprint, NextGen, Scientific Games, 1×2 Gaming, Genesis, Realistic Games, Iron Dog, and Gamevy, among others. Players can try their luck on over 600 gaming items, and half of them are slots. The game variety at Phone Vegas is beyond question. From basic fruit machines to animated video slots, the operator took care of everything. You don’t need to think twice to launch games like Foxin’ Wins, Finn and the Swirly Spin, Bonanza, Jurassic World or Thunderstruck II because you know you’re going to have a great time. Rainbow Riches, Starburst, Gonzo’s Quest and Immortal Romance are right there with the greats, offering a memorable spinning session at the least. All the table action happens at blackjack, roulette, baccarat, and craps tables. There are around 30 options for players who enjoy card games, dice games and roulette with some rare and interesting variations. For example, Phone Vegas offers Vegas Strip Blackjack and Blackjack Pro Monte Carlo Single Hand. There’s also French Roulette, Multi Wheel European Roulette and Blackjack Player’s Choice. Several video poker machines are listed together with regular table games, like Aces and Eights, Louisiana Double and Deuces Wild. There is a separate category for scratch cards, containing games like Big Foot Scratch, Irish Eyes, Bunny Boiler and Emperor’s Garden. You won’t be able to play any keno and bingo games at the Phone Vegas online casino due to the simple fact that there aren’t any. Online casino reaches a higher level when played with real dealers. That’s what Phone Vegas offers through such titles like Live Roulette and Live Blackjack, courtesy of Extreme Live Gaming. The range so far covers only these two popular games, but we’ll see if the operator has any plans for further expansion. Perhaps the versatile game library does not set apart Phone Vegas from other online casinos – but a wide selection of banking methods certainly does. Customers are free to use credit and debit cards to fund their accounts (Visa, MasterCard, Maestro, JCB, Solo, Switch, Diners Club and Discover), the Pay by Phone service (only available to UK clients), PaysafeCard prepaid cards, EcoPayz, Neteller, Skrill, iDeal, Sofort, Qiwi, Giropay, Webmoney, Euteller and bank transfer. Minimum deposit amount is €/$20 for the majority of available methods. Withdrawals are subject to a processing fee of £/$/€2.5 or 25kr per withdrawal. Phone Vegas Casino won’t leave you hanging whenever you may need help. The help centre is open 24/7 and provides assistance via online chat or email. Friendly and helpful staff will work on any issues diligently and make sure everything is running smoothly for each account holder, without exception.